There are so many things to do in Lake Garda that it would be impossible for one agency to know everything. As well as the official Lake Garda tourist information offices, which you can find in almost all of the major towns, there are now also many Pro loco offices. Pro loco offices are set up to provide very local knowledge of the town or district they are serving and are usually run by people with a passion for the area so you can expect a great service. Of course some are set up better than the others, and provide information in an easier to follow format. This map of the Lake Garda Tourist Information and Pro Loco offices will at least help you find the offices in the area you are are interested in. I’ve spent may hours searching to provide the info on this map so if you can’t find what you’re looking for then apologies…I will continue to update the map and your input is always welcome. Click the box in the top right hand corner of the map, which will open it in a new window. Click on the menu icon in the top left of the map to open the list. Click on an icon in the list or on the map to open up the info window. I recommend you always click the ‘More Info’ link as the info provided may be useful. 1. To erect our own tent. 2. Cook our won meals frequently. 3. Have use of facilities if possible. 4. Be near to lake. It seems that one cannot erect a tent anywhere – Is this true? Or what must I search under? My wife is visiting family in New Zealand so it is myself and the 3 children aged 13,11 and 7 years. So, needless to say cost is a factor. I would appreciate it if you could send me a town plan of Garda (the town) as I am booked for two weeks. Ciao, there is a cable car at Makcesine that takes you up Monte Baldo. Follow the links and you will find the prices. Hope this helps. HI Can you tell me if ticket and tours websire is legitmate to buy gardaland tickets. Hi John, yes totally legit, please purchase using a link on Love Lake Garda as it helps our visibility. I am wanting to travel to Lake Garda in October, probably about 17th October for one week with my Wife but I am unsure if the main places of interest will still be open. Has anyone had experience of travelling to Lake Garda in October and offer me any useful tips? Sorry for the late response. Lake Garda is and all year round destination, it depends what what you’re interested in but I’m sure you’ll find plenty to do. October is a great time to visit…the weather can still be quite warm. I spent the last 6 October’s in Lake Garda….at the very least you’ll be able to visit the historic lakeside towns without the crowds. I’m sure you will love it. Caio, We are wanting to do a full day trip on the Lake in June stopping off at a few towns and then continuing on. Much like a hop on hop off trip, Can this be done, if so, what ticket should I purchase and what is the cost? Hi Jenny, when you arrive you should go down to the ticket office in the town you are staying. They will have lots options of which towns to visit in one day, usually they have itineraries pinned up on the wall of the ticket office. remember the lake is very big so you will probably only want to visit 4 or 5 towns in one day. It is best to do some research on the towns before you go then you can get an idea of where to go. I am just in the process of creating a page for each town, they should be ready by the end of March so keep checking back. I will be updating the time tables and price list on our Lake Garda Ferries page soon. Hi. We are arriving by train at Desenzano in July and catching the LN027 bus tonRica Del Garda. Can you tell me when the July bus timetable will be available on line please. Also there are 4 adults each with a suitcase and I understand there will be a charge for this on the bus. Thank you for helping. Venice. Could you please give us some suggestion about how to travel from Riva del Garda to Venice? Hi Mark, this is a list of Lake Garda market days, there will be artisan market throughout the season, you will need to check back on the Love Lake Garda events calendar to get info about these. Ciao. We are staying in Limone early July. I have booked the opera in Verona. What is the best way and most economical way of getting there. I have booked a night stay and want to travel back to limone the following day. Thank you. Hi Mark, sorry I can’t help you to locate that particular shop but there are similar shops in most towns around the lake. Hi Jane, I believe there is a bus service between the airport and Bardolino, i think the line you want is 164 but I’m not sure how late the buses run. You would need to contact the bus company direct to check. Have you tried your hotel to see if the run a shuttle or transfer service? I am due to spend two weeks ( at two different hotels) around the Lake ,, I am unsure as to hire a car or travel around by Bus , water ferry. Are there any “local ” car hire firms I can hire for a shorter period ( rather than the full two weeks) ? I am arriving to Verona by train ,,, what cost would a taxi be to Barbarano ? I would like to do a bit of fishing when we stay in Garda in September. Is there a permit I require, how would I get one? Also are there any shops which sell bait in the town? Can you tell me if the ferry ticket offices on Lake Garda accept credit cards please, last time (2010) they didn’t. Similarly cable car. 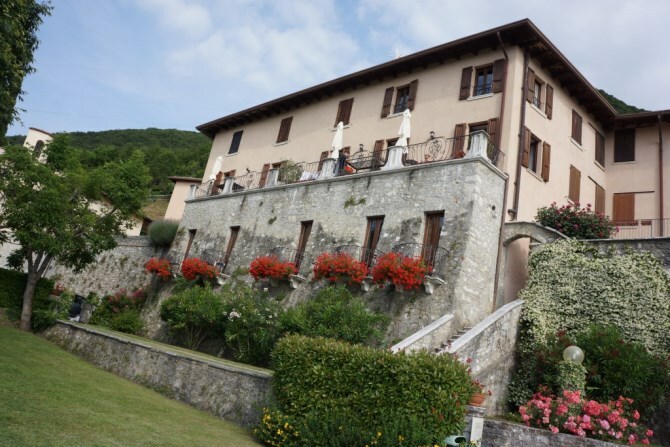 We are staying at Gardone Riviera next week. Ciao Stella, I believe you can pay with credit cards at the ferry ticket offices. You can buy tickets on line for the Monte Baldo cable car using a credit card. Hi John, yes you can always find somewhere to park. There’s plenty of free parking around the lake but it’s usually time limited. If you do find s free space you will need to set your parking dial in the car to show what time you arrived. If you’re not lucky enough to find a free space you can expect to pay around €2 per hour on average.